Thin-film processes are needed to make metal wires and to insulate those wires, to make capacitors, resistors, inductors, membranes, mirrors, beams and plates, and to protect those structures against mechanical and chemical damage. Thin films have roles as permanent parts of finished devices, but they are also used intermittently during wafer processing as protective films, sacrificial layers and etch and diffusion masks. Metallic, semiconducting and insulating films are employed (Table 5.1) in microfabrication. Films are often used, however, not because of their metallic, semiconducting or dielectric properties, but for other features. For example, doped single-crystalline silicon carbide is a semiconductor, but amorphous SiC thin films are insulators for all practical purposes. SiC is frequently used as a structural material in high-temperature/corrosive ambient microdevices because of its excellent mechanical and chemical stability. Similarly, silicon is used not only for its electronic properties but also for its mechanical strength (micromechanics), optical absorption in visible wavelengths (solar cells, photodetectors), low absorption in infrared (waveguides for 1.55 ^m optical telecom applications), high Seebeck coefficient (thermoelectric devices) and because of special properties of certain silicon microfabrication processes. Silicon nitride is used for free-standing thin membranes as etch and oxidation mask, as an etch-stop and polish-stop layer and as a passivation material that protects from mechanical and chemical damage. effects. The size scale for quantum effects is estimated by Debye lengths, which are of the order of 10 to 100 nm at room temperature. The density of thin films is often very low compared to bulk materials. Sputtered tungsten films can have a density as low as 12 g/cm3 compared to the bulk value of 19.5 g/cm3. Thin films are often porous, which results in long term instability: humidity can be absorbed in the film, and high surface-area porous films oxidize and corrode readily. Many thin-film properties, resistivity, coefficient of thermal expansion and refractive index are thickness dependent. Deposition processes have profound effects on all film properties as shown in Table 5.2 for resistivities of sputtered molybdenum films. The films have been deposited in different sputtering systems under slightly different process conditions. In Figure 2.8, tantalum structure and resistivity were seen to depend on underlying layer: tantalum film on tantalum nitride is very different from tantalum film on oxide. Structure depends on film thickness, and it may be that thick films are polycrystalline even though thinner depositions result in amorphous structure. This is shown in Figure 5.1 for SrTiO3 film. X-ray diffraction (XRD) peaks indicative of crystallinity only appear for thicker films. The dielectric constant s is also strongly thickness dependent. Films prepared by different sputtering systems are different, and films prepared by two completely different deposition processes will differ even more. Copper films made by sputtering, evaporation, electroplating or chemical vapour deposition (CVD) can have a factor of 2 differences in resistivity or grain size. When an amorphous film is annealed at high temperature, it will crystallize. But its crystal size and crystal orientation, and surface roughness will be different from a film that was initially polycrystalline, even though the films received identical anneals. With extinction coefficient (k) values 2 to 6 for metal films in the visible range, this translates to ca. 10 to 20 nm as a limit for transparency when a 1/e intensity drop is used as a criterion. 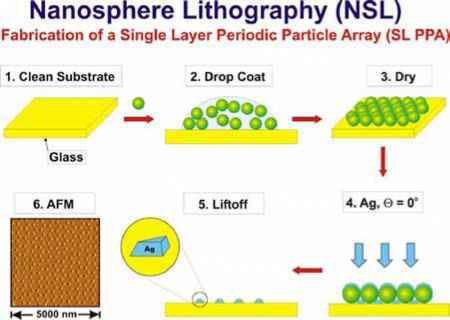 Physical vapour deposition is the dominant method for metallic thin-film deposition. All aluminum films in microfabrication are deposited by PVD, and PVD is used for copper, refractory metals and for metal alloys and compounds like TiW, WN, TiN, MoSi2, ZnO and AlN. The general idea of PVD is material ejection from a solid target material and transport in vacuum to the substrate surface (Figure 5.2). Atoms can be ejected from the target by various means. Thin film deposition on substrate r v ■. .. --.- . .y-' ■■■„■ ■-.■-■■■ . Shutter blades can be used to prevent deposition on the wafers during unstable flux (e.g., at the start of the deposition or during parameter ramping). Shutter blades enable very accurate and abrupt interfaces to be made, almost at the atomic thickness limit. Evaporation of elemental metals is fairly straightforward: heated metals have high vapour pressures and in high vacuum (HV), the evaporated atoms will be transported to the substrate (Figure 5.3). Atoms arrive at thermal speeds, which results in basically room-temperature deposition. Evaporation systems are either high-vacuum (HV) or ultra high-vacuum (UHV) systems, with the best UHV deposition systems with 10-11 Torr base pressures, and 10-12Torr oxygen partial pressures. There are very few parameters in evaporation that can be used to tailor film properties. There is no bombardment in addition to thermalized atoms themselves, which bring very little energy to the surface. Substrate heating is possible, but because of high vacuum requirement, there is the danger of outgassing of impurities from heated system parts.